Ample material drawn from the latest research has been integrated into the text and highlighted in special feature boxes, including recent views on homology, cranial nerve organization and evolution, the relatively large and elaborate brains of birds in correlation with their complex cognitive abilities, and the current debate on forebrain evolution across reptiles, birds, and mammals. Comparative Vertebrate Neuroanatomy is geared to upper-level undergraduate and graduate students in neuroanatomy, but anyone interested in the anatomy of the nervous system and how it corresponds to the way that animals function in the world will find this text fascinating. 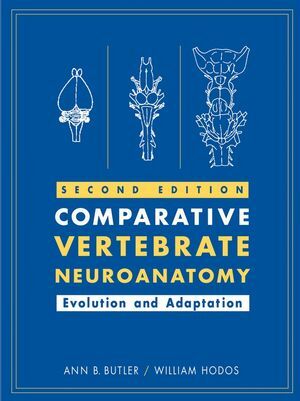 Ann B. Butler and William Hodos are the authors of Comparative Vertebrate Neuroanatomy: Evolution and Adaptation, 2nd Edition, published by Wiley. PART ONE: EVOLUTION AND THE ORGANIZATION OF THE CENTRAL NERVOUS SYSTEM. 2. Neurons and Sensory Receptors. 3. The Vertebrate Central Nervous System. 4. Vertebrate Phylogeny and Diversity in Brain Organization. 5. Evolution and Adaptation of the Brain, Behavior, and Intelligence. 6. Theories of Brain Evolution. PART TWO: THE SPNIAL CORD AND HINDBRAIN. 7. Overview of Spinal Cord and Hindbrain. 9. Segmental Organization of the Head, Brain, and Cranial Nerves. 10. Functional Organization of the Cranial Nerves. 11. Sensory Cranial Nerves of the Brainstem. 15. Overview of the Midbrain. PART FOUR: THE FOREBRAIN: DIENCEPHALON. 19. Overview of the Forebrain. 20. Pretectum. Accessory Optic System, and Migrated Posterior Tuberculum. 23. The Visceral Brain: The Hypothalamus and the Autonomic Nervous System. PART FIVE: THE FOREBRAIN: TELENCEPHALON. 26. Visual Forebrain in Amniotes. 27. Somatosensory and Motor Forebrain in Amniotes. 28. Auditory and Vocal Forebrain Amniotes. 29. Terminal Nerve and Olfactory Forebrain. 31. Evolution of Brains: A Bilaterian View. Appendix: Terms Used in Neuroanatomy.